With the rise in technology being incorporated with media, many brands have started using new, unique innovations to show how modern their companies are. Tommy Hilfiger is one such brand that will be using virtual reality to give their customers a more immersive experience. Once InStyle unveiled their virtual backstage tour plans, we knew there would be major hype in the fashion industry. We all remember how dazzled we were by Tommy Hilfiger’s fall/winter 2015-2016 collection at New York Fashion Week, but now the line will be given a whole new dimension. On Tuesday, the brand kicked off this new technological feature in their New York City store on Fifth Avenue, but the fun doesn’t end there; the company is making this a global affair, and will be extending out to London, Paris, Milan, Amsterdam, Dusseldorf, Florence, Z‚Äö√†√∂¬¨‚à´rich, and Moscow. WeMakeVR helped Hilfiger create the 360-degree virtual reality system. Founder and CEO of the company Avinash Changa expressed the prospect for improved quality as time goes on in an interview with WWD. “Daniel embraced the technology at a very early stage,’ he said. The first viewers in New York on Tuesday were treated with a 3D view of the stunning fall 2015 collection, giving a firsthand experience of what it is like to experience a Fashion Week runway show, from the front row, no less. To view the runway, customers at the select stores look through a Samsung GearVR device. While the quality of the picture is far from perfect, there is no doubt the technology will be improved over time. This shows that the bridge between the virtual world and reality is beginning to be constructed, and before long this could become to new norm in the fashion industry. And he couldn’t be more right about that. The well-loved brand is embracing its customers in a new way. CEO Daniel Grieder notices and is doing everything he can to accommodate the new changes. With that kind of customer-based forward thinking, there’s no telling what Tommy Hilfiger will be able to accomplish with technology. This step forward has crossed the threshold into a whole new world, and as the quality of virtual reality continues to get better with time, the outlook will be more exciting. 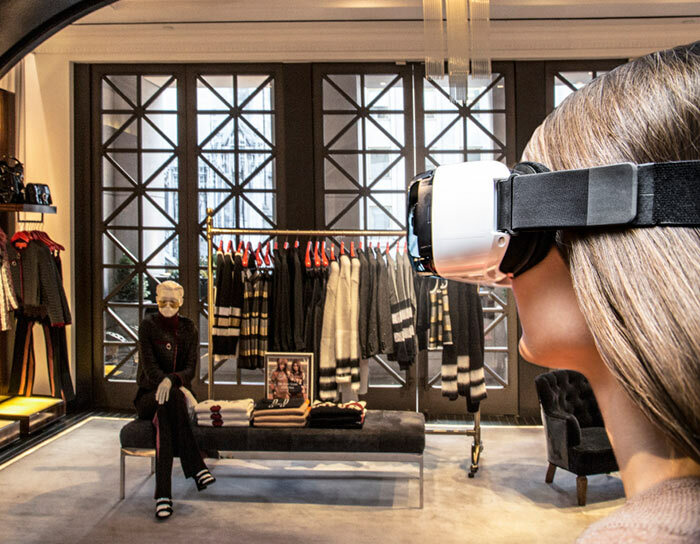 We love that Tommy Hilfiger has brought virtual reality into the everyday world, and I personally can’t wait to experience the new innovations in technology the brand brings forth.